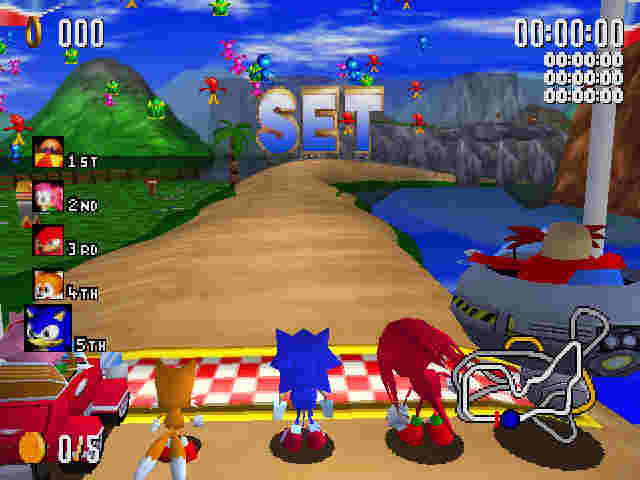 Sonic R (ソニック R) is a little known racing game developed by Traveller's Tales and Sonic Team for the Sega Saturn and PC, the latter version being ported to the GameCube in Sonic Gems Collection. It features characters from the Sonic the Hedgehog series. The game is characterized by the same sense of environmental openness in the Sonic platformers. It contains colorful 3D graphics combined with a strong soundtrack by Richard Jacques (including songs performed by British singer T. J. Davis).